Hi everyone! Today is the first day of Spring but it’s rainy and windy here in Northern California. Hopefully we’ll have more sunny days so I can go back to my hikes. As some of you may know, I love hiking. I used to go for a 5 mile hike (5 times per week) to a very nice park called Lagoon Valley Park in Vacaville, California. 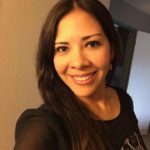 It really helped me to lose some weight and release some stress. But, my left knee started hurting (I guess because I overdid it due to the hill being very steep) . Now that the pain is almost gone, I’ve started walking and hiking twice a week but as soon as the weather gets nicer I plan to go back to my 5 days a week. Anyway, I had some apples to use so I decided to make an apple cake and add some booze to it. 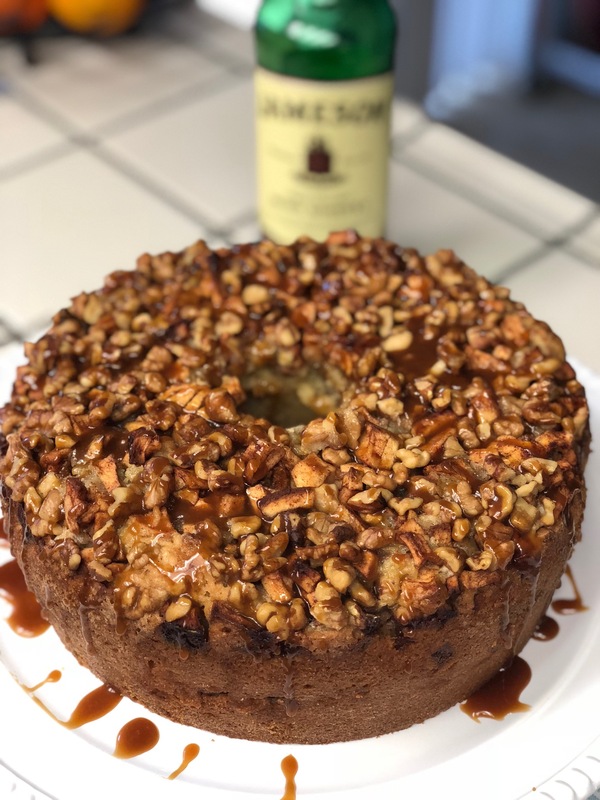 I looked around for recipes and some of them inspired me to make an apple cake with whiskey and walnuts. I baked this cake last Thursday and it was still really good for Monday breakfast. Wish you a happy baking day! Prepare a tube pan with butter and flour .Set aside. Peel and chop apples. 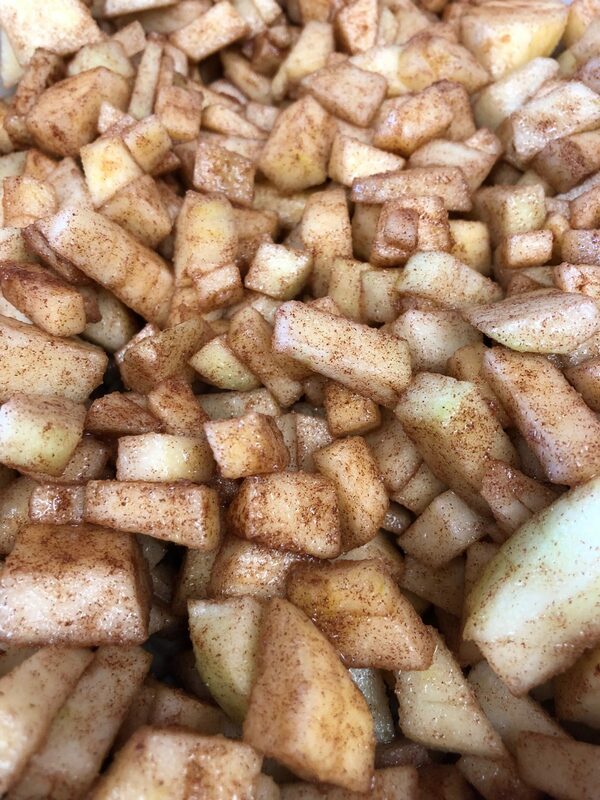 Sprinkle with ½ cup of sugar and 3 teaspoons cinnamon, and set aside. In another bowl mix sugar, oil, whiskey, orange juice, vanilla and orange zest. In a mixer bowl pour wet ingredients in to dry ingredients, and stir to combine. Add eggs one at a time, beating each one at the time. Pour half of the batter into the bottom of the tube pan, then top with half of the apples. Bake for 90 minutes or until it’s done. If the cake is getting super dark on the top and it’s not all cooked yet, put some foil over it and finish baking. Cool in pan for 20 minutes and remove to a wire rack to finish cooling. Heat sugar and water in a large heavy skillet over medium heat and cook, swirling skillet occasionally so sugar melts evenly, until it is a dark amber. Do not burn the sugar. Add whiskey and carefully ignite with a kitchen match (use caution: whiskey will ignite in a ball of flame). When flame dies out stir in cream and bring to a boil. Boil until liquid reduces some and then remove from heat and whisk in butter. Remove from heat and allow to cool slightly . Pour caramel over the top of the apple cake. DO NOT POUR SUPER HOT CARAMEL ON THE CAKE. Make a cup of coffee or tea and enjoy a slice of cake. This cake can last up to 4 days (room temperature and in a cake storage ontainer). If you want to warm it up, just put the slice you want to eat in the microwave. 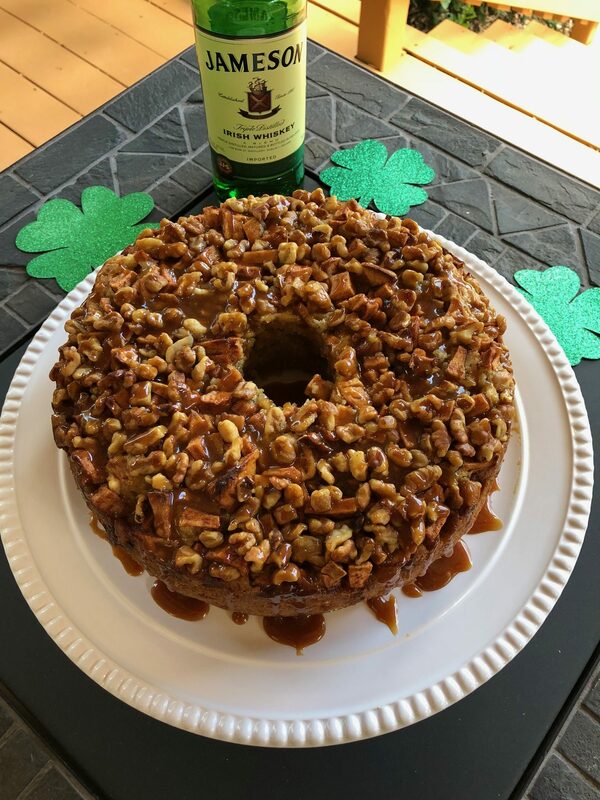 This entry was posted in Recipes and tagged apple cake, baker, blogger, cake, dessert, whiskey.